Nail and staple guns are extremely common tools within the modern workplace. These devices are intended to affix two or more materials together. Some examples here can include cabinetry, plasterboard, carpets and mouldings. These handheld tools can be powered by a number of different methods and depending upon the need, nails or staples can be used. 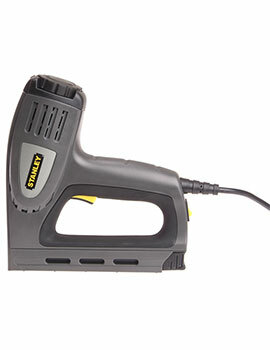 Here, at Buildworld, we offer a range of Nail & Staple Guns. Explore our range and pick the right one that suits your requirement. Gas-powered units utilise pressure in order to eject nails or staples from their tip. They will commonly employ carbon dioxide, as this is a non-flammable gas. Cartridges can be placed into the gun although there are also times when a separate hose is attached to a nearby power source such as a compressor. 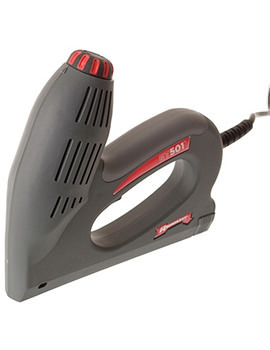 Cordless nail or staple guns are excellent options when mobility is a concern. For instance, roofers and those installing drywall will employ these units, like climbing ladders and working at heights is much easier. This type of gun can be powered by gas or a built-in electrical supply (such as a rechargeable lithium-ion battery). As the name suggests, pneumatic devices utilise the power of air to propel a staple or nail into a material. The air is supplied with the use of a cord attached to a separate compressor tank. One of the advantages associated with these variants is that it is sometimes possible to adjust the output of the air. Thus, more or less pressure can be used to penetrate materials. This is useful when dealing with substances such as concrete or masonry. These units are powered by mains electricity with the help of a cord. Their main advantage is that they will not need to be recharged, as a constant supply of power is always present. Novices and do-it-yourself enthusiasts will often opt for this version, as it can be easily kept within the average workshop. The only drawback is that the cord may present certain safety issues. Some of these guns also have a battery which will be charged when attached to a mains power supply. Although cost is always a concern, it is also logical to examine what the gun is intended to be used for. Those who are looking for greater levels of durability may opt for cordless versions or gas-powered models. Standard or one-off tasks might be better suited for a gun that is powered by mains electricity. Buildworld supplies a wide range of models to select, so please have a further look before deciding.